Michael is continuing to intensify and storm surge and hurricane warnings are in effect for the northeastern Gulf Coast. By 11 p.m. Monday, Michael's top sustained winds were around 90 mph (144 kph) as it headed north at 12 mph (19 kph). Forecasters say the center of Michael will continue to move over the southeastern Gulf of Mexico Monday night and then move across the eastern Gulf of Mexico Tuesday into the evening. A Storm Surge Warning is in effect for the Okaloosa/Walton County line to the Anclote River in Florida. A Hurricane Warning is in effect for the Alabama/Florida border to the Suwannee River in Florida. A hurricane hunter plane reports Michael has gotten a little stronger as it moves off of the western tip of Cuba. By 8 p.m. Monday, Michael's top sustained winds were around 85 mph (140 kph) as it headed north at 12 mph (19 kph). The National Hurricane Center says the storm is centered about 60 miles (100 kilometers) off the western tip of Cuba, and about 485 miles (785 kilometers) south of Apalachicola, Florida. Hurricane-force winds extend out up to 35 miles (55 kilometers) and tropical-storm-force winds outward about 175 miles (280 kilometers). Forecasters at the Miami center say Michael is expected to strengthen quickly and become a major hurricane by Tuesday night. Landfall is expected Wednesday on Florida's northeast Gulf Coast. Escambia County Sheriff David Morgan warned residents during a news conference Monday evening that first responders won't be able to reach them during the storm or immediately after. "If you decide to stay in your home and a tree falls on your house or the storm surge catches you and you're now calling for help, there's no one that can respond to help you," Morgan said. "That's the criticality of following directions." Florida Gov. Rick Scott said during a news conference Monday that the Florida Agency for Health Care Administration has reached out to hospitals, nursing homes and other facilities to make sure they're prepared. In the days following Hurricane Irma last year, 14 people died after a South Florida nursing home lost power and air conditioning. "My expectation is if you're responsible for a patient, you're responsible for the patient. Take care of them," Scott said. "That means you need to make sure that you have backup generation power, or you shouldn't be taking care of the patients. It's as simple as that. So my expectation is everybody gets taken care of." Gov. Rick Scott reiterated his warnings Monday evening during a news conference in Escambia County, encouraging residents along the coast to follow any evacuations orders as soon as possible. He specifically pointed to forecasts of 8-12 feet of storm surge that could reach miles in from shore. "Storm surge is absolutely deadly," Scott said. "Do not think you can survive it." 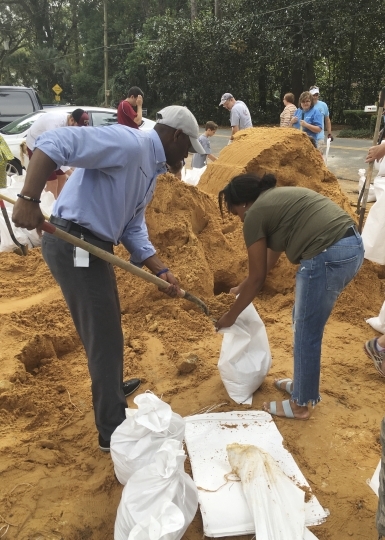 Gillum said Monday that officials initially thought, "we will have outages and it will be inconvenient." He added, "Today it is about life and safety." He said, "There's nothing between us and this storm but warm water and I think that's what terrifies us about the potential impacts." The hurricane, currently off Cuba's western tip, is expected to make landfall on the Florida panhandle and affect portions of southern Alabama. Some southern Alabama counties were under a tropical storm watch Monday afternoon. High surf warnings were in effect already at the Alabama coast. The governor's office cautioned that flash flooding and tornadoes are possible with any hurricane. The National Hurricane center says the storm is expected to become a major hurricane by Tuesday night. In a Monday afternoon update, forecasters said winds have increased to nearly 80 mph (129 kph) as the storm moves north at nearly 9 mph (14 kph). Hurricane-force winds extend outward up to 35 miles (56 kilometers) from the storm's center and tropical-storm-force winds extend outward up to 175 miles (282 kilometers). The storm was located about 30 miles (48 kilometers) northwest of Cuba's western tip and 520 miles (837 kilometers) south of Apalachicola, Florida. Hurricane-force winds and strong rain were being felt in Cuba. A storm surge warning was issued for Florida's Gulf coast from the Okaloosa-Walton County Line to Anclote River. Three Florida Panhandle counties have issued mandatory evacuation orders ahead of Hurricane Michael's expected landfall. In a Facebook post Monday, the Wakulla County Sheriff's Office said no shelters would be open in Wakulla County because Michael was forecast to become a major hurricane with winds topping 111 mph (178 kph). The sheriff's office says Wakulla County shelters were rated safe only for hurricanes below that threshold. Residents are being urged to evacuate inland. The sheriff's office says Michael "has the potential to be a historic storm — please take heed." The National Hurricane Center in Miami says Michael's top sustained winds were around 75 mph (120 kph). The storm was moving north around 7 mph (11 kph). The storm was centered about 20 miles (30 kilometers) off the western tip of Cuba, and about 145 miles (230 kilometers) east-northeast of Cozumel, Mexico. Forecasters say Michael will move into very warm waters in the Gulf of Mexico. It could strengthen into a major hurricane with winds topping 111 mph (178 kph) before an expected strike Wednesday on Florida's Panhandle. Michael has become a hurricane as the storm gets ready to move into the Gulf of Mexico. Forecasters at the National Hurricane Center in Miami say Michael will move over very warm waters and could strengthen into a major hurricane with winds topping 111 mph (178 kph) by Tuesday night. Michael was lashing western Cuba late Monday morning with heavy rains and strong winds. According to the hurricane center, Michael's top sustained winds were around 75 mph (120 kph). The storm was moving north around 7 mph (11 kph). The director of the National Hurricane Center says Florida's Big Bend could see up to 11 feet (3.35 meters) of storm surge after Tropical Storm Michael strengthens into a hurricane over the warm waters of the Gulf of Mexico. Ken Graham says the storm's large size, strong winds and heavy rains could produce a lot of flooding, and the shape of this stretch of coastline makes it particularly vulnerable to storm surge. Water being forced on shore by the storm could get trapped in estuaries and rivers and pushed inland. A tropical storm that rapidly formed southwest of Cuba could become a dangerous Category 2 hurricane by the time of an expected midweek landfall on the Gulf Coast in the Florida Panhandle. Florida Gov. Rick Scott has issued an order for a state of emergency for 26 counties to rush preparations in the Florida Panhandle and the Big Bend area, freeing up resources and activating 500 members of the Florida National Guard. Scott says: "This storm will be life-threatening and extremely dangerous." Michael became a tropical storm on Sunday with sustained winds of up to 50 mph (85 kph). But it rapidly intensified, and its top winds clocked in at 60 mph (95 kph) by late Sunday evening. 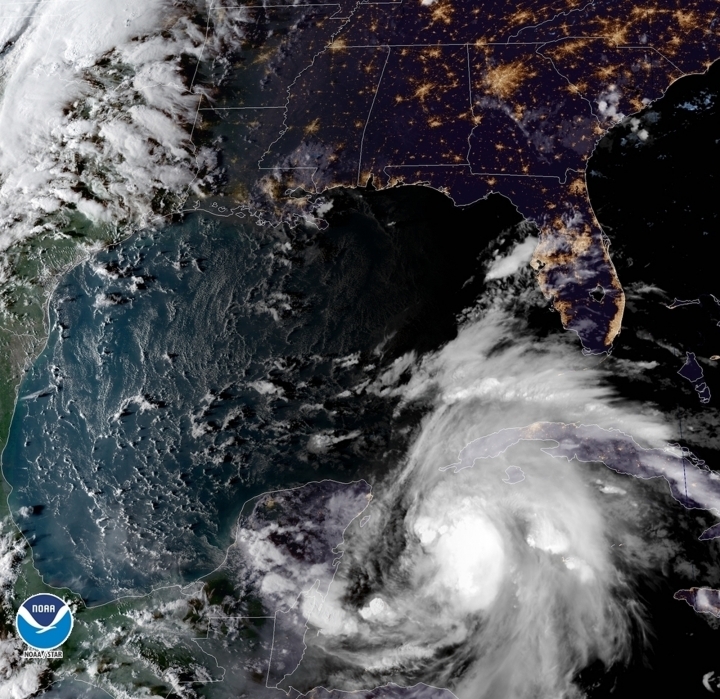 The storm is expected to gain hurricane status by Monday night or Tuesday as its core slowly crawls into the Gulf of Mexico, nearing the Florida Panhandle coast around midweek.